Will the Toon impress in Preston? Deepdale awaits… | NUFC Blog. Ex Toon coach and now North End manager, Alan Irvine, will have his latest recruit, Michael Tonge, available for selection. The 26-year old midfielder, on loan from Stoke, has not seen any action with the Potters in the Premier League this season, with just three Carling Cup appearances this season. “He has done a tremendous job to keep Preston at the level they are at for the last few seasons. “It will be very, very tough. I know Alan quite well and he is a very good coach and manager. “That is why he is where he is and has done as well as he has. “He is still very well thought of here at Newcastle and was a man with a lot of qualities. “He will know the team and what a lot of our players can do because he has worked with them. On the Newcastle United side, one man on a mission will be Andy Carroll, who will want to prove himself, following an unsuccessful loan spell with Irvine at North End in 2007. Lets hope he manages to net a few to show them what he really can do. Chris Hughton should also have Gutierrez available for selection following his recovery from a recent thigh strain. While it would be nice to get a chance to see french winger Fabrice Pancrate who signed for us on Saturday, his appearance will be dependent on his registration being sorted and the likelihood is he will sit out this game. With West Brom in top spot again following their game yesterday, a win against Preston will see Newcastle back on top of the table. 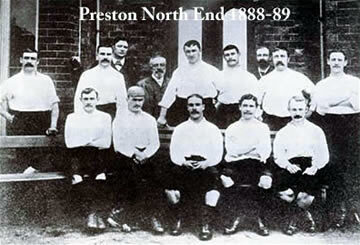 Preston however are hardy competitors. Having spent virtually the past decade in this division they know what it’s all about and they can play some decent football. Let’s hope as the winter months are starting to close in, the Toon continue to show us what they are made of, starting here, a cold, wet Monday night in Preston. The match is on Sky at 7.45pm for anyone unable to make it to Deepdale. Welcome Lilywhites! Newcastle United v Preston North End match preview. Bad feeling about tonight to be fair! Overall, as long as we are in top 2 at the end, i dont care about top place. Yes, it would be nice, but there is no difference between 1st & 2nd financially. You’re right as long as we go up, that’s all that counts. Saying that it would be nice to have a bit of silverware of any description. I was just writing about how even the Champions in the Championship can expect to be beaten ten times or more in a season, and that the last team to buck this trend was Reading in in the 05/06 season when they lost only two games. Even they drew quite alot though. Off topic but nice interview with Danny Simpson. Just the kind of player we want, so hopefully his loan spell will be made permanent in January. Toonsey I agree with the bad feeling side of things. A decent display against posh then two weeks of with the players resting on that display, scares the crap out of me. I need to get a job as it’s killing me not getting to games this year, god I miss it. Hope the lads prove me wrong tonight. Think it will be back to the 4-5-1 formation tonight. Saying that did not help my gut feeling about tonight. Anyone else going to Deepdale tonight? Johno Toon – As things stand now, i’d take a draw. Its another hard away game with a point if we can get a draw. We can add to West Brom, Cardiff, Sheff Utd and Crystal Palace list of decent away results. Add Preston in that and i think thats 5 of our toughest away games done, with the smogs and Leicester to come away from SJP. I wouldnt fancy going to QPR last day of the season having to get something either. Our next game after this is Swansea at home, they are no pushovers either. Mags09 – Was going to go, but couldnt get out of work. My next game is Sheff Wed on boxing day. I’d take a draw down there. But I’ve got a feeling it’ll be 2-1 to us tonight. Agree with you BBM – looks like a draw coming up. But then I’ve been negative about every away game this season. Now it’s tinged with a little optimism and I wouldn’t be surprised if we won!